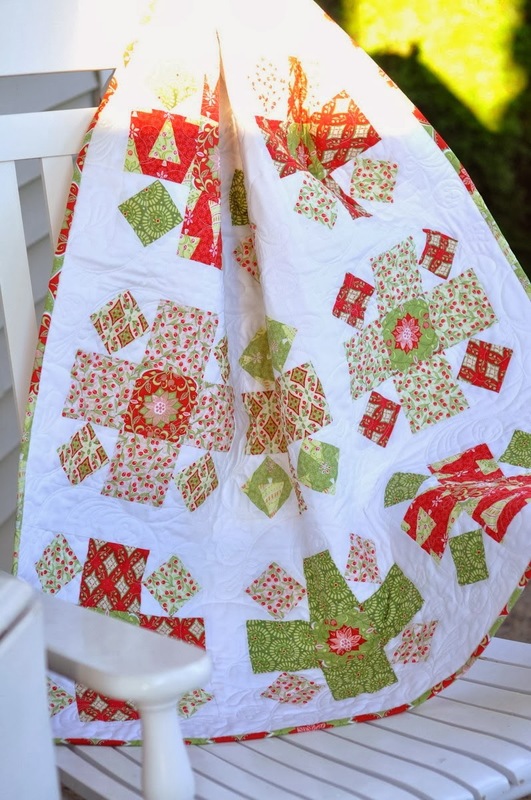 Home / Uncategorized / Holiday Bouquet Quilts popping up! My day – actually “days”- were made this week when I received two emails to beautiful Holiday Bouquet projects. It is so gratifying as a designer to see people take your fabric and make something beautiful and personal! The first quilt is from Jodi Nelson of A Pleasant Home. I love how clean and fresh this baby-sized quilt looks! It is just so pretty! 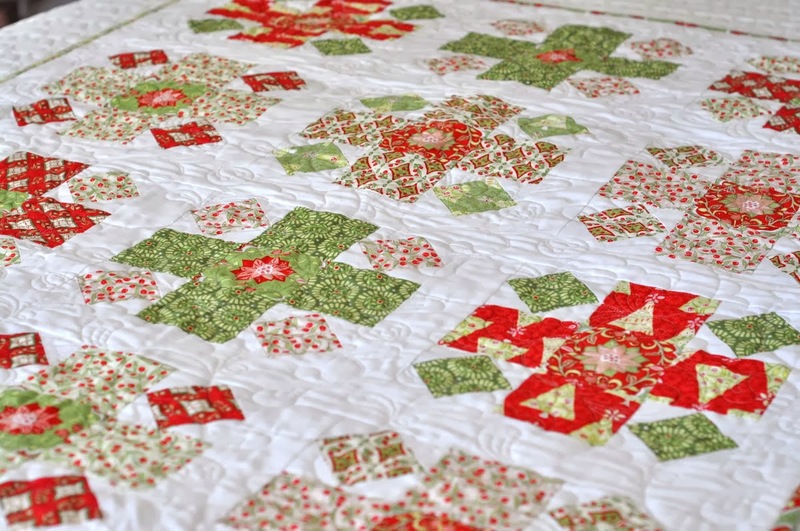 Best of all, Jodi has a tutorial for the block she used on her blog so be sure to check it out! Next, Linda Hoover emailed me a picture of a Holiday Forest quilt from my book, Modern Holiday, sewn in my Holiday Bouquet fabric line. Now I have to make one of these for myself! Thanks so much for sharing, both of you! I love seeing what everyone makes – it is so fun! Previous post: My Block of the Month Under the Veranda and Diamond Runner patterns are here! Amanda, I saw this fabric line in a magazine article for a table topper you designed and love it! The ornaments are to die for! I would describe this line as classy there are very few Christmas fabrics that I would classify as more modern that aren't cartoony ( if that makes sense.) I tried to find it on Etsy but there was very little available. Do you know any places to look, preferably places that sell bundles (and are reasonably priced as my fabric budget is very small)? My husband and 11 yr old daughter were in the hospital recently. I normally make everything for other people but would love this fabric to make a quilt for our family to keep. Thanks for your keep and those are lovely! I have your book and can't wait to make the tree quilt. 🙂 Sorry for the long comment! Both quilts made with your fabrics are gorgeous! And, congratulations are being the featured quilter in the new Quilty magazine! YOUR FABRICS ARE MIND BOGGLING. YOUR BAGS AND QUILTS ARE SO REFRESHING!!!!! HAPPY HOLIDAYS AND HOPE YOU HAVE MANY SACHER TORTE COOKIES.